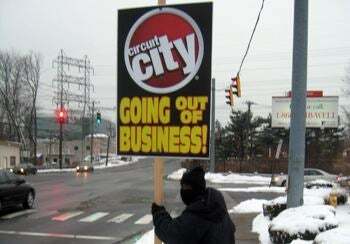 It’s coming to a close a bit sooner than expected: Circuit City’s going-out-of-business sale will end Sunday, March 8. Great American Group, one of four firms managing the liquidation of the once-great electronics chain, has announced that Circuit City’s $1.7 billion in inventory is just about gone. So if you’re looking for a killer bargain on whatever’s left in stock -- or even store fixtures like display shelves, a ratty office chair, or the manager’s coffee mug -- now’s your last chance. I’ve seen Circuit City ads over the past few days that promote discounts of 90-percent or so, but it’s a pretty safe bet that the 65-inch plasmas and Blu-ray players are all gone. What’s left? When it comes to the final days of a liquidation sale, you can never tell. Maybe there’s a 32-inch HDTV with a cracked bezel, an open 50-pack of DVD-R discs (with a few missing), or a demo laptop that may or may not boot. Liquidation sales are always a bit sad: Roped-off areas to shrink the retail space; open boxes with manuals, cables, and other flotsam scattered everywhere. Harry McCracken of Technologizer captured the mood beautifully in his The Tragic Last Days of Circuit City pictorial. It’s hard to believe that Circuit City was once the second-largest consumer electronics retailer in the United States. If we’ve learned anything about going-out-of-business sales over the past few weeks, it’s this: Don’t bother going the first week. That’s when the liquidator, hoping to reel in the suckers, cuts prices a measly 10 percent. You’ll almost always find better deals at competing retailers, particularly if you comparison-shop online. The real deals come deeper into the sale -- say, weeks 4 to 6 -- but by then you run the risk of missing out on the items you want. If you’re planning to stop by your local Circuit City this weekend, it’s wise to call first. Some of CC’s 567 stores in the U.S. have already closed their doors.